The fetal anomaly scan is a highly specialized scan generally performed by a Senior Sonographer. 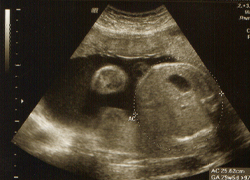 The fetal anomaly scan is usually performed from 18 weeks and up to 24 weeks. All fetal parameters are measured, i.e. head, abdomen, spine, Doppler's blood flow and baby's kidneys. The fetal heart will be examined for any congenital heart abnormalities. The fetal anomaly scan also looks for any fetal or placental abnormalities. The baby's full anatomy may include examination of the face for cleft palate and hare lip, limbs, bladder and brain in this detailed scan. Low lying placenta may be also diagnosed at this anomalies or detailed fetal ultrasound scan. If the placenta was found to be low lying or covering the internal cervical os which may or may not if persist, become placenta praevia in future. This will need to be rechecked again using ultrasound scan at 36 weeks of pregnancy. Any problem found will be explained to you and your GP and your Midwife will be informed if you so wish.